A large number of businesses tend to assume that B2B buyers are only willing to talk to a sales person when they are coming to the end of the buying journey. However, new research from Aberdeen shows that buyers are more likely to contact a vendor at the start of the buying process. This means that the traditional inbound approach, which is usually driven by SEO, may not be as effective as we like to think. While SEO-optimized content can help get a B2B buyer’s attention, it may not lead them through the buyer journey as well as you hope. While the content on your site may be based on detailed persona research, as well as keyword optimized and designed to answer the most frequent questions. It might not provide the information a buyer needs for them to take the next step. As 50% of B2B buyers say they have incomplete, unclear or poorly defined criteria when considering the business needs prior to purchase, how are you meant to address these needs? Only half of B2B buyers say that their business goals are well defined when they are researching a purchase, which means your optimized content is likely to have a better impact. In comparison, 42% of buyers only have partially defined goals, so vendors are only able to address some of their requirements. As well as a lack of understanding when it comes to business goals presenting challenges, the buyer journey is not always a straight line from point A to point B. More often than not, half of purchase process stall either for a period of time or permanently. In fact, 53% of B2B buyers say they pause or stop the purchase process at least half of the time. This means vendors need to work to keep buyers fully engaged throughout the process, or re-engage them in a bid to show the benefits of making a purchase. Failing to do so can mean that buyers never return or that they start the process over, which can introduce more competition. One fact that can make things even more difficult to vendors is the fact that buyers don’t consider their ill-defined business goals as a reason. Instead, they blame the vendor’s inability to meet their needs – even if these needs are not set. The vast majority (66%) of buyers who cancel or postpone a purchase do so because they don’t see any differences between the different solutions on the market. This suggests that vendors aren’t doing enough to put across their unique selling point (USP) or that this isn’t as different or sought after as they might think. On top of this, 57% decide that no vendor meets their needs, which could perhaps be a decision that’s avoided by having a conversation with the buyer at the earlier stage. While you can deal with general needs in your website’s content, addressing those associated with individual businesses is not possible. Talking to a B2B buyer earlier in the process or creating varied content types that answer questions they may have at the start can help a vendor frame how their service can better answer the needs of a business. This is why it could be a good idea to provide an option for the start of the buying process, such as a demonstration, which can either be live or recorded for various industries that a business caters to. Interestingly, 73% of buyers say they reach out to vendors fairly early on in the buying process. Some 47% say they talk to vendors when they’re starting their research, while 26% talk to vendors when defining their needs. Despite this early contact, many B2B buyers are still stalling in their purchase. This could be due to vendors assuming that a buyer is further along in the journey than they actually are. Ultimately, this can mean the sales team is giving more of a ‘hard sell’ rather than highlighting the aspects of the business that buyers are interested in early in their journey. The research shows that buyers are happy to talk to a vendor earlier than they usually would if the vendor is able to help them define their needs (32%), tell them something they didn’t know about the category of the buyer’s competitors (28%) or provide them with objective information to help frame a decision (38%). These results suggest that vendors may need to consider whether they are telling buyers what they think they want to know and whether this is offering anything new. It could be that the best results will come from challenging a buyer about what their business really needs. After all, if you can use new industry findings to better position your business, it shows a potential B2B buyer that you know your stuff and can be trusted to deliver good service. In fact, 65% of buyers said they were likely to work with a. vendor that challenged their way of working by highlighting a need they weren’t aware of. However, these challenges only really work at the beginning of the buying process and could put a buyer off if delivered too late, once again highlighting the importance of early contact. When it comes to getting a buyer to rethink what they think their business needs are, the most effective way is to show a new way to solve an established problem, which was chosen by 62% of respondents. Some 43% said that a vendor making them aware of a coming change in the market was effective, while 40% said that highlighting a pain point of weakness the buyer wasn’t aware of was a good option. Challenging a buyer and offering new solutions can increase the chances that you’ll be included in the final consideration set. 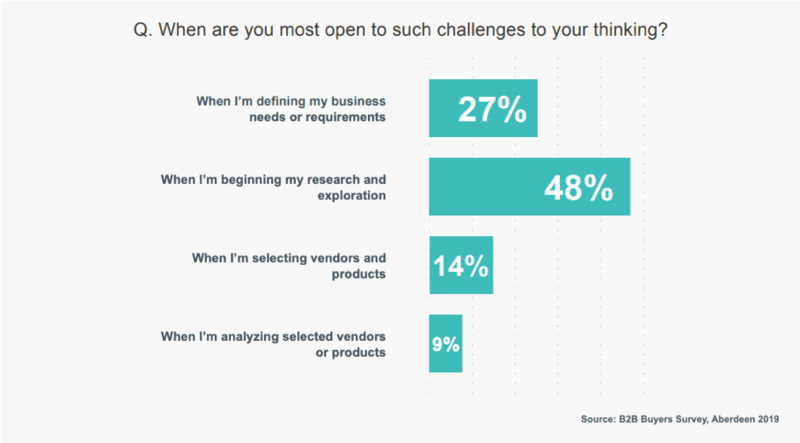 A third (33%) of B2B buyers say they are open to new vendors if they show a new way of solving an old problem, showing that start-ups and small vendors need the knowledge to offer different solutions. Vendors that have a vision to make a buyer’s company better are also more likely to be considered in the final stages, with 22% saying this is the case. Showing new ways to solve a problem can also help shorten the process overall, with 66% of B2B buyers saying this is the case. This means that challenging a buyer and earlier contact can help them sign on the bottom line faster and reduce the amount a vendor needs to spend in order to secure a sale. Reassessing the buyer’s journey and taking into account that half of buyers don’t have well-defined goals when starting the research process could help you better address their needs earlier on. Rather than assuming that buyers who contact your sales team are coming to the end of their journey, vendors should be ready to deal with situations that arrive at the start of the process. Look at opportunities, such as challenges you can frame, competitor information and new solutions, to help shorten the buying process and give B2B buyers a reason to believe in your brand. It’s also important to use buyer intent data to improve your on-site content and any information to send to potential buyers, such as emails. Doing all of this could not only see you land more sales but do so in less time.